This is an order form for 12 towels at 1 dollar a piece. 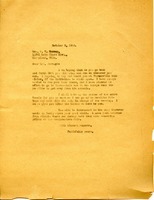 Martha writes to Alois with a check for towels and wash clothes that were suppose to be given to her at West End Savoy. 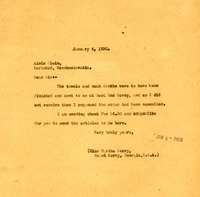 Letter notes that towels were ordered and letter was left to accompany them for Mrs. Curtiss but not yet received. 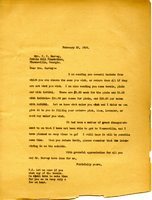 Martha Berry writes to Mrs. P. W. Harvey about sending her an order of several baskets of towels. 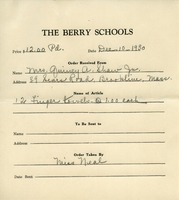 Letter letting Mrs. Harvey know that her order for towels and baskets will be made as soon as possible. 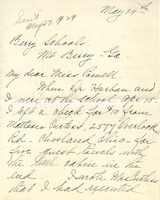 Martha Berry lets Mrs. Harney know she would like to come visit her in Thomasville and that she also hopes that she will come to visit Berry. Martha Berry also lets her know she will take care of getting the towels done. 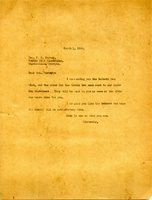 Mrs. Harney thanks Martha Berry for the letter she sent which answered her questions about the towels. She lets Miss Berry know she would like her to go ahead and begin making the towels, lets her know how many and of what color she would like, and lets her know what nice towels they are. Kate Harney lets Martha Berry know that her invitation to visit still stands. She also lets Miss Berry know how pleased she is to her of her success.